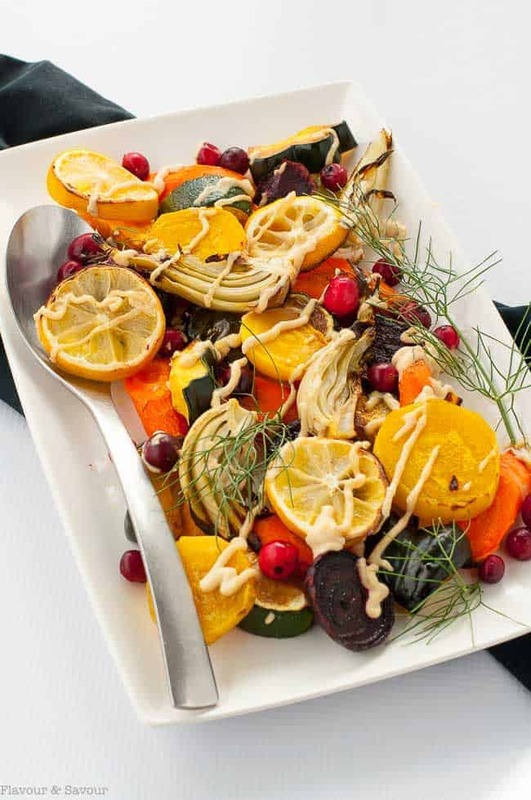 This one pan dish of oven roasted vegetables and lemon tahini dressing is a colourful, nutritious and flavourful side dish. Quick and easy. Paleo and vegan. Beets, carrots, zucchini, and so much more! 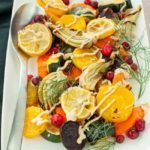 These lemon tahini roasted vegetables make a spectacular side dish for any fall or winter meal. Fresh roasted lemon slices and zesty lemon tahini enhance the natural flavour of harvest vegetables, roasted to crispy perfection. It’s easy to eat from the rainbow and gets lots of fresh, colourful vegetables in your diet in the summer months, but it’s just as important in the fall and winter. This recipe uses some of my favourite harvest vegetables, like carrots, acorn squash, red and yellow beets, fennel, and sweet potatoes, but you can substitute your family’s most-loved veggies. Peel and chop the ones you’ve chosen, toss with olive oil, sprinkle with sea salt, and roast in the oven until edges are crisp, and vegetables are fork tender. Add a few lemon slices and, if you like, (and I did) toss some fresh cranberries on the tray during the last few minutes of roasting for an extra punch of flavour and colour. Finally, remove from the oven, transfer to a serving platter and then add the crowning touch: drizzle with Lemon Tahini Dressing. Why tahini? 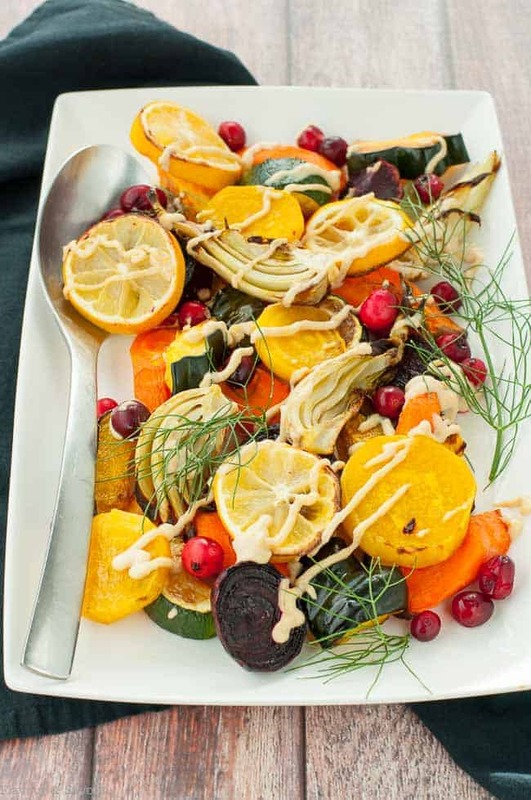 Not only does the lemon flavour of this tahini dressing add some zest to these roasted vegetables, but tahini is a powerhouse of nutrients. 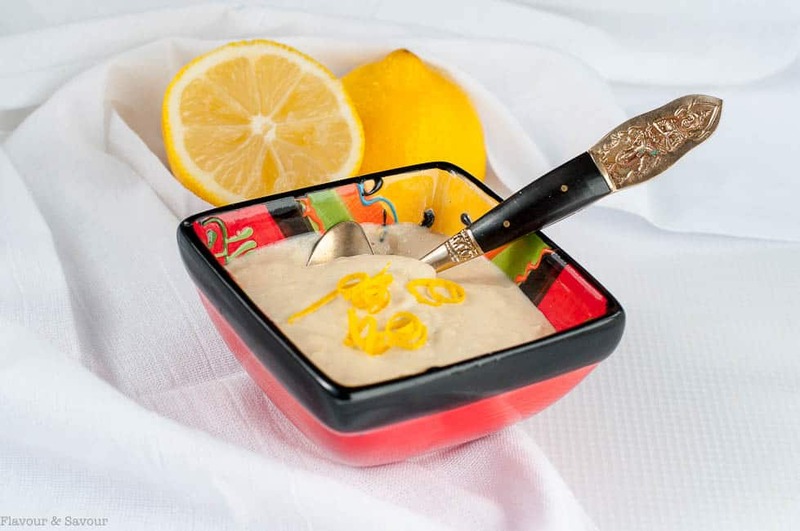 Tahini is a paste made from toasted sesame seeds that is popular in Middle Eastern and Eastern Mediterranean dishes. 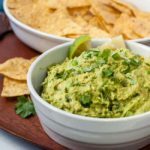 It’s an ingredient in hummus and is a delicious way to get more iron, magnesium, calcium, phosphorus and thiamine into your diet. 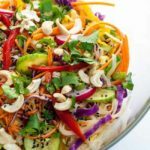 If you’ve tried it before and didn’t like it, try it in this tasty Lemon Tahini Dressing instead. So good! First, cut the vegetables in uniform sizes according to their density and how long they take to cook. For example, beets take longer to cook than zucchini, so slice them thinner. Next, heat the baking sheet in the oven for a few minutes before adding the vegetables. A hot pan helps to sear the vegetables right away. Space the veggies out on the baking sheet so they are not touching. In this way, they’ll roast and get slightly crispy edges, instead of cooking in the steam from their “neighbour” and turning out soft and mushy. I used two baking sheets for this recipe so the vegetables had lots of room. Flip the veggies over half way through cooking time to help sear on both sides. Missing summer? Need some colour in your meals? These colourful Lemon Tahini Roasted Vegetables brightened up our dinner on a dull, rainy day here on the West Coast. I hope you like them, too! This one pan dish with a variety of oven roasted vegetables and lemon tahini dressing is a colourful, nutritious and flavourful side dish. Quick and easy. Paleo and vegan. Combine all ingredients in a blender or food processor. Set aside to allow flavours to blend. 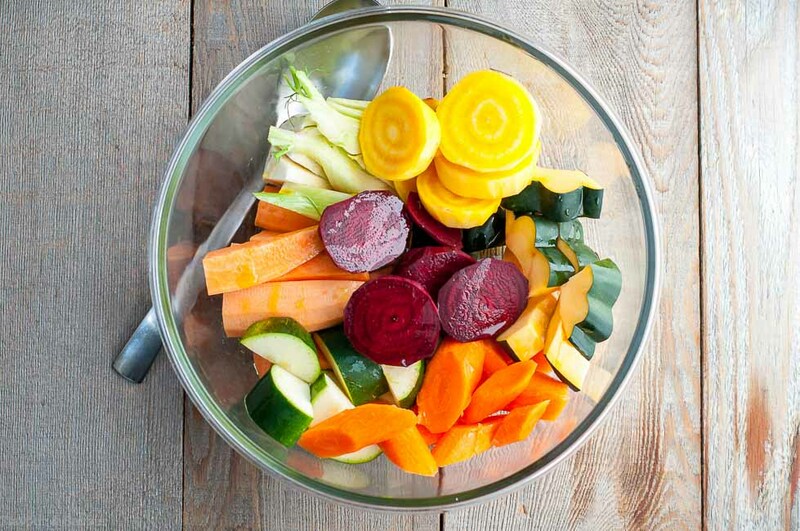 Peel and chop vegetables into uniform sizes so they will cook in the same time. Toss with olive oil and sea salt. Heat a baking sheet with low sides in oven for 5 minutes. 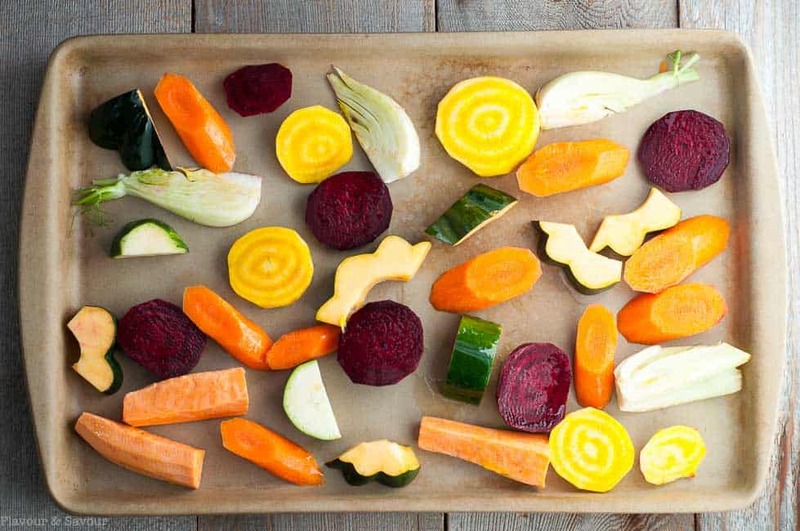 Arrange vegetables and lemon slices on baking pan, spacing so they are not touching. Roast for 15 to 20 minutes, turning once part way through roasting time. Add cranberries for last 5 minutes of roasting. Remove when vegetables are beginning to brown and are fork tender. Transfer to serving platter and drizzle with lemon tahini dressing. Serve immediately. 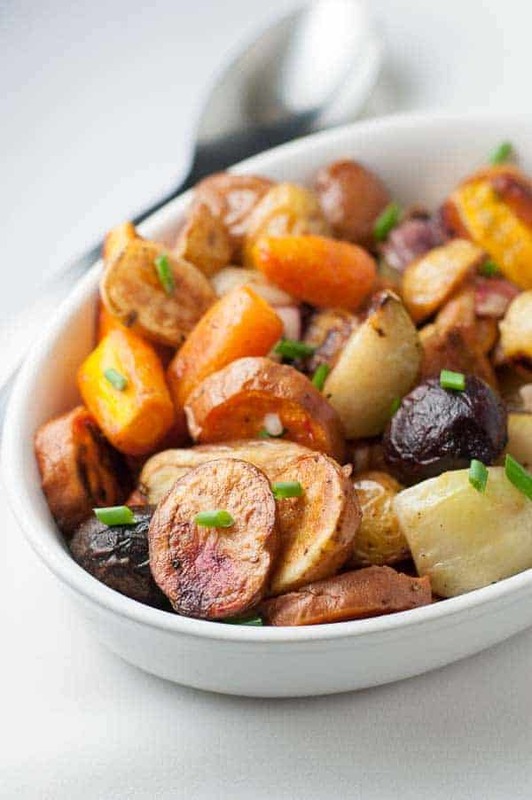 If you love roasted vegetables, you’ll like these Apple Cider Roasted Root Vegetables too. 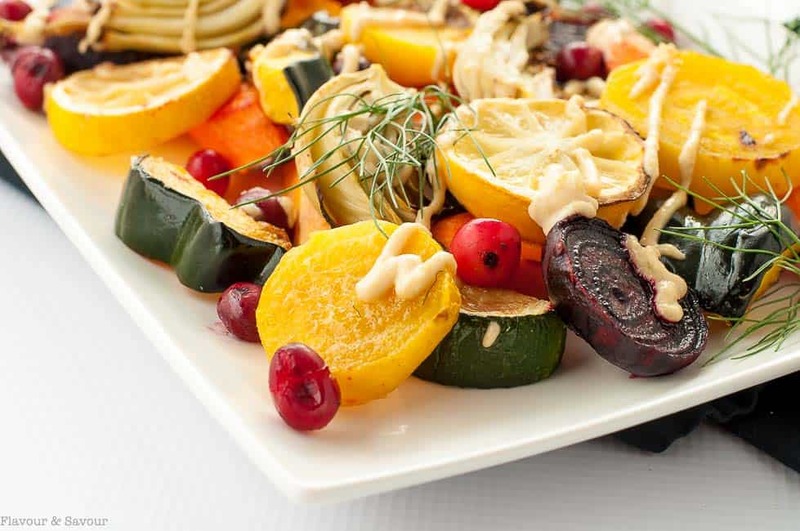 Like this recipe for Lemon Tahini Roasted Vegetables? Pin it for later or share it below! Send her over–we’re probably about the same age! 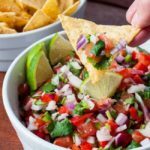 🙂 Potlucks and entertaining–sounds like me! LOVE it! I love roasted veggies and love tahini in dressings, so this sounds just about perfect! I must make this soon! 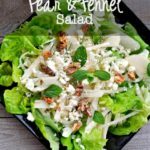 It’s a great combination–lots of colour, and lots of flavour from the dressing, too! Thanks for commenting! What a vibrant looking dish! I’ve been craving a big bowl of roasted vegetables lately. Something so bright and colorful is necessary on these dark, rainy days. Definitely colourful, definitely healthy! Yes–add a little more protein and it would be a complete meal!